To say that Labels & Systems, a label producer in Tampa, Florida, is an unusual company is a bit like saying that a platypus is an unusual animal. But unusual does not mean unsuccessful, in either case. Labels & Systems operates in a carved out space in the warehouse area attached to a beautifully restored old cigar factory near downtown Tampa. There are no signs to indicate that a $1 million plus per year label producer is in the building, and the parking lot is a patch of grass near the loading dock. But the story gets better. Labels & Systems has only one press and just four employees—a press operator, a graphic designer/prepress specialist, a winder/inspector, and Owner/Manager Michael Felitti. Their manufacturing floor space consists of 2500 square feet. The two small offices would fit inside a good sized suburban living room. The debt-free company ships to customers in 49 states and the occasional Caribbean island and Mexico. A bakery in Alaska relies on the company for its labels. 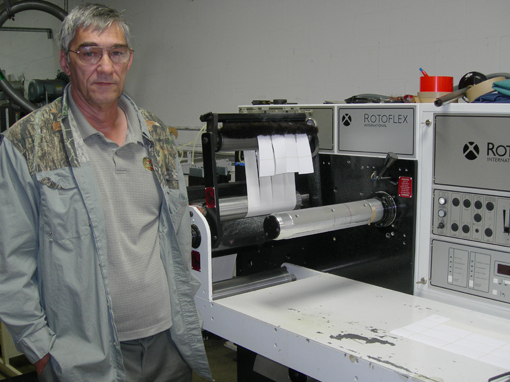 Felitti, opened the doors at Labels & Systems in 2001. Felitti’s first foray into the printing business, however, was in 1973, when his father hocked the family 1968 Dodge station wagon to let him buy a 1250 Multigraph offset press and an 8×12 Gordon letterpress. Felitti set up shop in his home and later moved the equipment to commercial space. Business was good through the 1980s, but in the early 1990s Felitti’s customers began failing and he folded the business in 1994. Not about to leave his customers stranded for product, he began brokering pressure sensitive labels. He continued to sell work for label printers through 2000. But by 2001, Felitti thought he could print labels and serve his customers better than the printers for whom he was brokering, so he and two partners opened the doors at Labels & Systems. It is important also to understand Felitti’s perspective on technology. In his offset and letterpress business, he did a lot of forms work, including insurance and bail bond certificates. He was an early computer adopter, using a Compugraphic line input typesetter and some of the first Apple computers. Felitti is one of those rare birds who moved from hot type to cold type to today’s digital printing world, and loved every minute. Today he uses both Macs and PCs in his business. Felitti also prides himself on his knowledge of his customers’ businesses, and their label needs. He establishes naming conventions for each customer’s labels that are based on the way the customer describes the labels or inventories them. This enables him to quickly establish a dialog when the customer calls. Labels & Systems may be unusual, but so is the service they provide to customers.